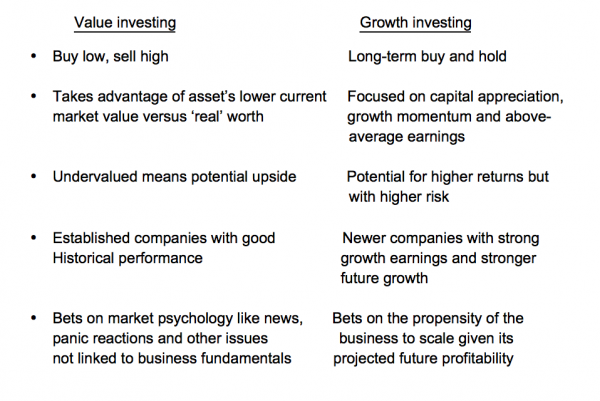 Value Investing vs Growth Investing: What are the Key Differences? The first thing that confuses people who are relatively new to the investment world is the ‘jargon’ used by experienced investors. You come across various types of investment strategies which can be scary if you’re clueless as to how each one applies. The two most popular strategies that muddle the water are value investing and growth investing. You may wonder how the terms “value” and “growth” can be separated when rationally, they are linked. But influential investors have taken opposing views that resulted in two contrasting investment strategies. As a novice investor, it is important to have a clear understanding of both and know their key differences. Value investing is the trademark of billionaire Warren Buffett. Many say the legendary investor was able to accumulate massive wealth and build his business empire because he used this investment strategy. Buffett follows the golden rule, particularly in stock investing – buy low and sell high. It’s a no-brainer and basically the surefire way to grow your money. However, there’s more to Buffett’s approach than just a simple principle. Value investing requires scouting the market for shares of companies that sell below their intrinsic or real value, according to Tan De Jun, Equity Analyst of iFAST Global Markets. “These are companies can be trading at a discount for a variety of reasons despite having strong fundamentals. Value investors seek to buy these “bargains” and hope that as time goes by, the company’s share price will eventually converge towards its intrinsic value,” Tan explains. Selling below value doesn’t necessarily mean cheap, because value is relative. The essence is to pick companies that are undervalued and whose prices are not consistent with their long-term potentials. Hence, it presents an opportunity for greater profit when you buy these stocks at deflated prices. But before purchasing a ‘value’ stock, value investors would compare its price to other companies operating within the same sector. Value investors meticulous and are numbers-driven. They are reliant on financial ratios. In their book, the financial ratios are the ultimate metrics to determine whether an equity issue is undervalued or overvalued. Growth investing is the strategy that’s a contrast to value investing. The proponents of this investing philosophy follow different criteria for selecting stock investments. Tan from iFast defines growth investing as an investment strategy focused on looking for companies that have delivered above average returns and has the potential to continue to do so in the future. “Growth investors often pay a premium for the company’s future earnings potential. The idea of growth investing is that the share price of the company will rise as earnings grow and eventually exceed current valuations. Growth stocks seldom pay dividends as most of its earnings are reinvested back into the business. Growth companies tend to start out as small caps that operate in fast growing industries, e.g. tech,” he further explains. iFAST Global Markets was launched with the main objective of protecting consumers with complete commission transparency in insurance and investment products. Investors can learn more about iFast Global Markets here. The concentration of growth investors is on companies that show the promise of above-average earnings growth and capital appreciation. To them, growth investing is not about companies that are on center stage. The selection process is all about choosing from among unheralded stocks that are likely to rise in value and become popular in the near future. Growth investing puts less emphasis on the present stock price and focus more on what the company could be in the future. Growth investors build their wealth by applying the long-term buy-and-hold strategy. They ride in the early stages of growth, hold then unload until such time it is no longer considered a ‘growth’ stock. Growth investors also follow a time-honored guide or metrics during the selection process. Companies belonging in growing industries are deemed as prospects. They believe the potential for long-term growth is present in three major areas: 1) new industries; 2) old industries that have farmed out into divisions and are experiencing spirited growth because of new products or have found new uses for old products; and 3) specialty industries that have opened new doors for expanding their products and penetrating into markets. In order to succeed, growth investors diligently monitor their portfolio of growth stocks. They pay attention to sales trends, profit margins, and return on invested capital. The sell signal comes when the company’s future growth prospects have dimmed. Also, a stock that reaches an uncharacteristically high price level could trigger a selloff. The time to sell is of critical importance for investors using this investment strategy. Tan De Jun from iFAST Global Markets offers a breakdown of the two investing strategies. Tan De Jun adds that value investors are usually not bothered by external factors such as daily price fluctuations or market volatility. In addition to the factors above, value investors often have a margin of safety, where they will buy a stock only if the share price is trading at a certain discount below its intrinsic value. This margin of safety helps to minimize downside risk and ensures that they do not overpay for assets. Opportunities for value investors arise when the markets overreact to negative news, causing the share price to fall unjustifiably. In order to have a better perspective of the key differences, knowing the 3 main characteristics of each investment strategy would help. Value investing is basically buying stocks that are: 1) priced lower than the broader market but will rebound in due time; 2) priced lower when compared to industry peers, and 3) less risky than the broader market because the companies are fundamentally sound. The characteristics of growth investing are divergent because: 1) investors are willing to buy stocks that are priced higher than broader market but can sell them at even higher prices; b) the high earnings growth records of the companies can be sustained regardless of economic conditions; c) investors are aware there is more volatility in growth stocks than the broader market. There is no absolute retort to the question as to which investment strategy is better. If you’re into value investing, you look for stocks that are trading at a bargain price. The stock price of a blue-chip company that is financially strong but undergoing an unfavourable business downturn usually falls below its intrinsic value. On the other hand, the school of growth investing preaches that earning potential is greater if you concentrate on companies that are exhibiting growth motion with substantial growth spurt still looming in the near future. The only common denominator of value investors and growth investors is their expertise in selecting the stock investment prospects. The approaches are different but the metrics or criteria for selection are strictly followed. Any mistake in the timing – buying or selling – could mean substantial financial losses. The skills are developed over time and no newbie investor should implement one or the other without proper training and experience. What are the areas to look out for? “Like Buffett, we think that growth and value investing are joined at the hip. However, it is dangerous to look purely at low valuation ratios and make decisions on buying stocks,” TJ Tan from DCG Capital warns. DCG Capital manages the DCG Asia Value Fund, which invests in publicly listed companies in Asia, ex-Japan, based on a value investing approach. Find out more about the fund here. Most of Jocelyn's professional work experience was spent in the financial services sector. She rose up the corporate ladder and became the Head of the Funds Management Group of an investment house. Concurrently, she was the CEO of an affiliate leasing and finance company and also held positions as the Corporate Planning Head of an oleochemicals manufacturing firm and CFO of an international activated carbon producer. Jocelyn has a Bachelor of Science Degree in Industrial Management Engineering, minor in Chemical Engineering. Since shifting to doing part-time financial advisory and business consultancy work, she also found time for her passion – writing. She is now able share her personal experiences as well as give insights into the world of finance, investments, and other topics of interest. She hopes her articles and blog posts can provide knowledge and direction to readers.